Welcome to the season of Aquarius! The people born under this sign are super friendly, unique, fun, and humanitarians at heart. 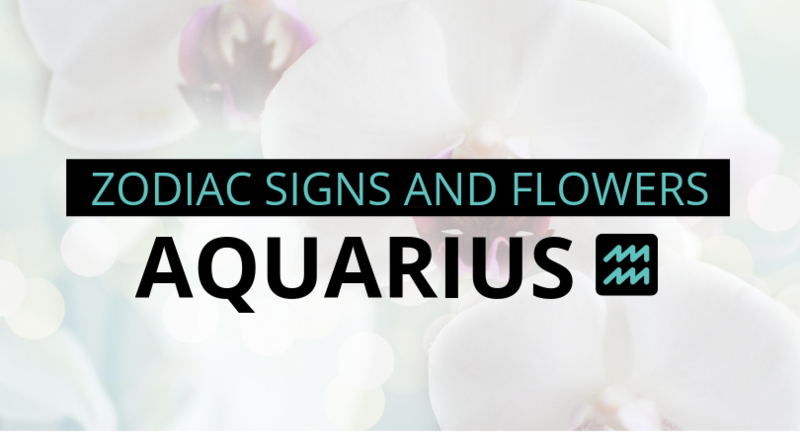 Want to know what flowers to send the stars of the zodiac? We’ve got a few ideas! ﻿ As interior designer Kelli Ellis puts it, “with so many sources of stress these days, we all need to find ways to chase away worries and blues at home.” This is where fresh flowers come into play! They are gorgeous to see and instantly uplift our mood. So, if you want to elevate the energy and feel of your sacred space (home), get you some flowers! The beginning of May means Mother’s Day is around the corner. We are sure you are preparing your shop for one of the busiest floral holidays of the year, so we thought we would help you out with some last minute marketing tips! These tips are simple ways you can grow your sales and get your business out there just in time for Mother’s Day. Have a new Instagram account? Want to promote it? Mother’s Day is the perfect time to let your customers know you are social. Have them Instagram a picture of their loved one with their bouquet designed by your shop and have them tag you. Run a contest and choose a random winner from those who tag you. The winner can get a free bouquet certificate or any other discount of your choice! Reach out to other shops in the community. How about a local jewelry store or candy shop? You can have an arrangement displayed in their store and plan to recommend each other to customers. If they are getting chocolate or jewelry, they need flowers with it too! Make a community connection while promoting your business and shopping locally. You know those guys who don’t own a calendar and come rushing into your store for flowers at the last minute? Make it easy on them with a flower bar. Set up vases, flowers and cards (or ribbon) near the front of your shop where those last minute shoppers can run in, choose their arrangement, and pay quickly before their loved one notices! Promote it on social media and have customers share your post for a discount! We know this year is going to be a busy, but successful Mother’s Day! Try one of these tips (or all) and check back with the Bloomin’ Blog for more great marketing ideas! Valentine’s Day is around the corner and the flower shop frenzy has already begun. As we get closer to the holiday, we wanted to offer some last minute, quick marketing tips that can help boost those sales! Offer a special on your social media. Have customers like you and share it with their friends. Have them pull it up on their phones and show it when they make their purchase. This is a great way to add likes to your Facebook page! Located next to a bakery? Have a friend who owns a business? Team up and recommend each other to customers! Tell your customers to get some cupcakes as a finishing touch with their Valentine’s Day arrangement and have the other business recommend you as well. You can share the business and build a great new connection. Put together an arrangement and donate it to a nearby bank or hotel. Say it’s for their lobby for free if you can leave some business cards as well. When customers cash their check or check-in to their hotel, the Valentine’s Day arrangement will spark their memory and soon enough they will be ordering from your shop! Try one of these tips or all and check back with the Bloomin’ Blog for more great ideas!